"Gather yee, gather yee for tales of generations past. Today the unsung ace of Project Aces, lost in a sea of casual titles and misunderstood by the audience, it's time this bird flies proud and high once and for all." Ah, the Ace Combat series. A personal favourite of mine that I saw grow from Arcade and PSX to current generation hardware with the odd crash & burn along the way. You will find the word "niche" and average the 75% mark on pretty much every review of every game in the series. They mean nothing to you and me, fellow child of the 80's who grow up on Brian de Palma's "Top Gun" and SEGA's "AfterBurner". Did you too wanted to grow up to become a fighter pilot, I wonder? "The Sky Crawlers" are a series of Japanese novels written by Hiroshi Mori. His vision of an alternate history Europe where World War II never happened is very much fertile ground for the imagination run wild. Although a time of peace, conflicts are arranged between rival corporations in order to advance whatever their individual goals may be. The jet engine has yet to happen. 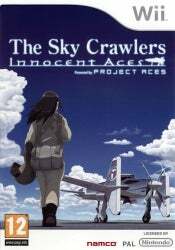 I had my launch day Wii for a few months when the news hit early 2008 straight out of Famitsu: "Project Aces developing exclusive Sky Crawlers entry for Wii". The images looked on par with previous PS2 entries, but how would it play? I had to wait quite about a year to find out and even that was by pure luck. A couple of my friends went to Japan early 2009 and I had them pick up for me both "Innocent Aces" and "Tatsukoko vs Capcom", years before anything was heard about either game having a western official localization. It was unique to the series in many ways I could not even imagine! Your wing and tip mounted machine guns are your best friend. There are special weapons for each plane that you can unlock along (free fall bombs, cannons... even shotguns!) with upgrades and colour schemes by destroying certain targets of performing S ranks, making sure that the 17 missions in the campaign offer plenty of re-playability. My advice is to drop the motions controls from the go. Oh, don't worry, they are well implemented and work much better than anything else in the genre on the Wii, but for me it was GameCube joypad right from the start, along with expert mode that allows you to rotate your plane on it's axis freely, something that feels rather more natural in every game you're controlling an air plane in a 3D environment. There are a couple of interesting features introduced in this game, such as the ability to perform manoeuvres on command by performing certain thumb stick combinations along with L+R, something that I often found saving me from fiery death. The other major new feature is the ability to start filling a gauge by tailing enemy planes and when you desire or it's filled to your liking, press Z to perform an automatic manoeuvre that will put your plane straight on the enemies tail, allowing to fill him with all new air holes to make their planes go faster. Don't worry, this is not something you can abuse or rely all the time if you're playing on Ace difficulty, making sure it does not ruin the experience. You can even play the whole thing without using it, but be prepared for some serious tailing and sore thumbs. Well played, Project Aces! So we have the backdrop, we have the team and the game mechanics all in there, how does "The Skycrawlers: Innocent Aces" fare on plot? That I will not spoil! It's best to be experienced spoiler free the first time you're getting into this. Know that the game takes place before Oshii's animated movie story wise, the genetic engineered children (Kildren) that will replace all pilots in the conflict are slowly introduced to the player, a rookie from Rostock, under the call-sign Lynx. I did see the OVA first, so I have no clue how I let it fly by me, but it was only at the very end I realized exactly who we were playing and it hit me like a Mach 3 punch to the stomach. Again, no spoilers here, go play the game already! Oh, I had forgotten how amazing the music was in this game. Another often overlooked staple of Project Aces... time once more to throttle up my custom red Suiga! Tally-ho! PS: I made a track in tribute of this game back in the day. Even made a instrumental version by request. Enjoy!